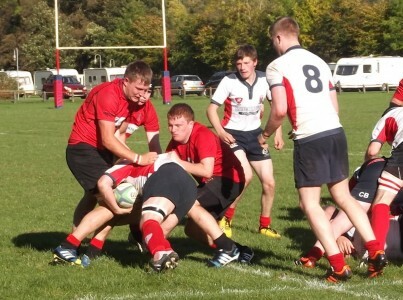 Linlithgow First XV travelled down to the Borders to play Langholm where it is always difficult to come away with points with a squad that now featured four of last season’s Academy First XV, as former school captain, Tom Townend, travelled with the Firsts to make his debut. The Reds established an early dominance in the scrum, as the forwards pushed the home side off their ball in the first two scrums. Stand-off, John Strachan, was also nudging his team forward with good kicking. Soon, however, play slowed down and was concentrated between the two 22s. The home side was awarded a penalty in front of the posts, which they converted to take the lead. Winger, Ty Watson, had a good run up the wing before he was bundled into touch. Alistair Wood then took a quick tap penalty which gained ground before the Langholm defence transgressed, giving Ross Martin an opportunity to score an equalising penalty. As the interval approached, the Reds suffered a double blow, as Alistair Wood had to leave the field due to injury and Langholm took another penalty opportunity to take a half time lead of 6-3. From the restart the home side pressed forward and won a scrum close to their try line. Once again the Reds pushed their way over the ball but the Langholm scrum half somehow managed to secure the ball and barge over the line for a try close to the posts. The resulting conversion was missed which reduced the damage. The Reds were stung into action and centre, Andrew Wood, made a tremendous break upfield. The ball was recycled and then fellow centre, Mark Green, crashed through tackles to dive over the line. Ross Martin scored the conversion to narrow the home side lead to one point at 11-10. The game continued to be scrappy but any moves came from the visitors. Dougie Thomson had a good run and even prop, Scott Herdman, found himself crashing up the wing. Soon after, the Reds missed an overlap with the line at the winger’s mercy. Nevertheless, it was Langholm who had the next opportunity to score when they missed a penalty on the half hour mark. Linlithgow had by then lost another of their back row to injury with Euan Richardson having to leave the field. Time was running out with the Reds pressing hard. Four rucks in front of the Langholm posts ended with the award of a scrum to Langholm. The Reds were not to be denied, however, and, when Green burst forward, the referee judged that a Langholm player had illegally prevented the ball from coming back to the Reds. There was one minute left on the clock when Ross Martin stepped up to take the penalty. He made it three successful kicks out of three, as the kick went straight between the posts to give Linlithgow a 13-11 victory. There was time for a re-start but Linlithgow held out. The game was never a classic but the Reds fought hard and deserved to come away with the win. Fraser Rankine; Ross Oliver, Mark Green, Andrew Wood and Tyrone Watson; John Strachan and Dougie Thomson; Calum McKeown, Stuart Cunningham and Scott Herdman; Patrick Bennie and John Pauley; Ross Martin, Euan Richardson and Alistair Wood. Subs: Conall Black, Tom Townend and Andrew McGown.